Dell has refreshed its Vostro 3000 and Inspiron R notebook lines, adding new features and Intel's latest processors. Targeting small and medium business users, the Vostro 3000 series includes 13, 14, 15 and 17-inch models (3350, 3450, 3550 and 3750). All iterations come with an Intel Core i3, i5 or i7 processor, and the 17-inch model has quad-core options. 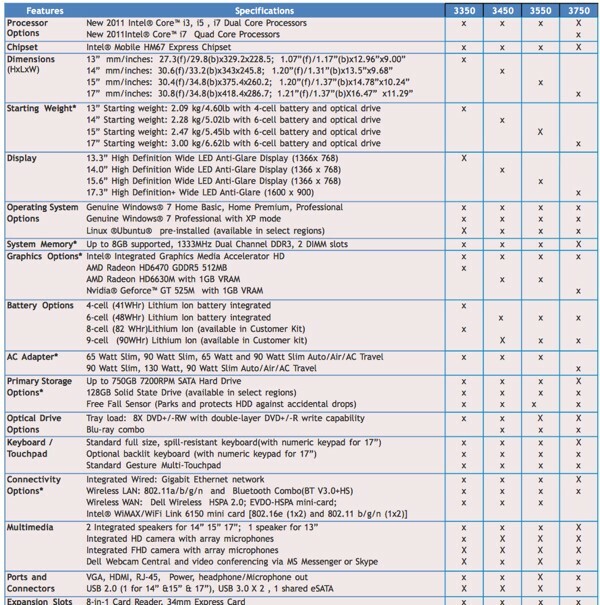 The spec sheet is too chaotic to cover thoroughly, so you'll probably want to compare the systems yourself if you're interested. Depending on the model you'll find up to 8GB of RAM, a Radeon HD 6470, HD 6630M, or GeForce GT 525M, up to a 750GB HDD or 128GB SSD, an optional Blu-ray player, as well as USB 3.0 and Bluetooth 3.0 connectivity. Vostro 3000s also feature an aluminum body, a backlit keyboard with chiclet keys, a matte display, SRS Pro sound, and an HD webcam. Battery sizes range from four to nine cells, with a max runtime of 12 hours for the largest unit. Pricing starts at $599 (13-inch), $499 (14 and 15-inch, and $549 (17-inch), and systems should appear online on March 22. Meanwhile, Dell's 14, 15 and 17-inch Inspiron R laptops have also received Intel's Sandy Bridge processors. Additionally, the systems now have swappable lids so you can change the look of your machine by purchasing new covers. There are reportedly 25 new lids and pricing ranges from $19 for plain black or $29 for Dell's spiffy designs. 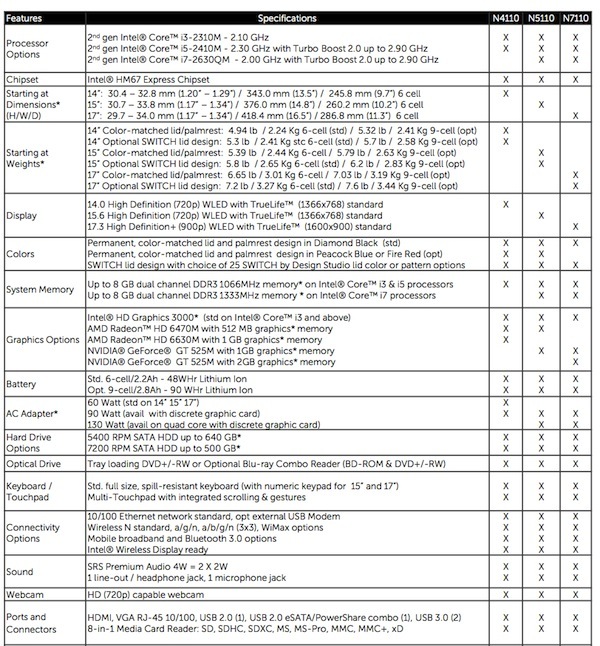 You can view a spec chart here, but configurations include the same RAM and GPUs as the Vostro 3000. Also on the menu: 640GB 5400RPM or 500GB 7200RPM HDDs, a Blu-ray reader, WiDi, and a nine-cell battery offering up to 13 hours of life. Pricing starts at $529 (15-inch) and $579 (14 and 17-inch), with availability slated for the "coming months."